The name ‘Harare’ is a corruption of the word ‘haarari’ which means ‘he who never sleeps.’ For many Zimbabweans, this city that never sleeps is a place where dreams come true, a place endowed with unfathomable beauty and blessed with hardworking people. This Harare is our Sunshine City. Harare’s heart lies in its Central Business District (CBD). However, looking at the current state of the CBD, it’s just about impossible to imagine that this is the central hub for what should be a vibrant African city. At every corner, you walk straight into litter. This is despite Harare city cleaners carrying out their duties on a daily basis. It seems that we all have become indifferent to a problem that is choking the life out of our beautiful city, and are disrespectful to the cleaners that are committed to their duties despite their measly compensation. We have lost pride in our city. There is no enforcement of the anti-littering law, and it is unbelievable that there is no scheduled collection of domestic and business refuse. The rainy season can easily worsen this situation, raising justified fears of disease outbreaks. There have been noble attempts to tackle this problem. Not long ago, the Anglican Clean Up Campaign and the Can Man of Mike Abrahams were campaigns led by members of the community that helped show us that there are ways in which we can shape our own environment without waiting for someone else to do it for us. 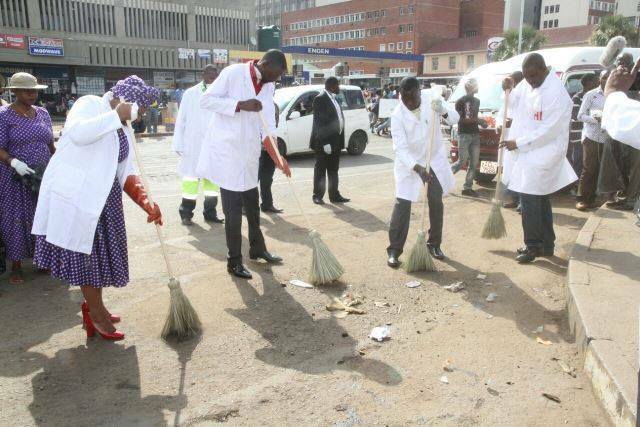 The United Family International Church with the Harare Council ran a massive clean up drive of the city last month. These campaigns can raise awareness of just how serious this problem is and may just encourage others to repeat the efforts. If different groups were to run these campaigns on a regular rotating basis, in their neighborhoods, what a difference that would make. The more that participate in cleaning the streets, cutting grass and trimming bushes, the easier the task would be. Those with particular skills can offer their services for free and at the same market themselves, which can lead to more paid work. When we see the results and realize that we can work towards restoring Harare back to the glorious city it once was, we will make greater efforts to maintain our surroundings. We can change the mindset of those individuals who have lost pride in their city. We can educate these same individuals on the negative impact that mindless littering can have on our environment and our health. We can also show Hararians that there is entrepreneurial potential in managing waste – reducing, reusing and recycling should be terms that we all become familiar with and act on. However, we still need the responsible authorities to re-honor their pledge to serve the people by collecting refuse for disposal at designated sites. The City of Harare must provide dustbins and motivate the cleaners by giving them appropriate pay and incentives. When all these collective efforts are combined, we can restore Harare to it’s former physical glory, and the millennium development goal for Harare to have world-class city status by 2025 can become a possibility. The time is right for every responsible Hararian to blow the winds of change across our beloved city that never sleeps.